It has been a busy and fun few weeks since last we spoke. Albert and I spent a very fun Valentine’s weekend in Palm Springs with our friends Gabi and Glenn by the pool and shopping the strip. We stopped at Starbucks on Palm Canyon to have a coffee and people-watch before driving home. I should now remind you that Albert never recognizes anyone. Albert is also a fan, so now he is as star-struck as I am. I should also add that we tend to leave celebrities alone in Los Angeles. I figured not many people would recognize him, we are not technically in LA, and I was not going to miss my opportunity to exchange words with this musical genius. I have read about little Viva and have heard songs written about her, including the brilliant Montauk, so it was thrill to meet her. She is the baby of Rufus with Leonard Cohen’s daughter, so she has amazing music potential in her blood. It somehow makes me happy that this little Amish girl could be Baby Gaga. My other recent star sightings have been less glamorous. We spotted Rip Taylor at the IHOP in WeHo, Anthony Bourdain at the Tender Greens in Hollywood, and “the tan lady” at the Veggie Grill. She looked ridiculously dark, and mentally unbalanced. The media had consumed her and spit her back out near the Cinerama Dome. On a more fun note, the Academy just gave out movie awards, and we celebrated by throwing an Oscar bash. 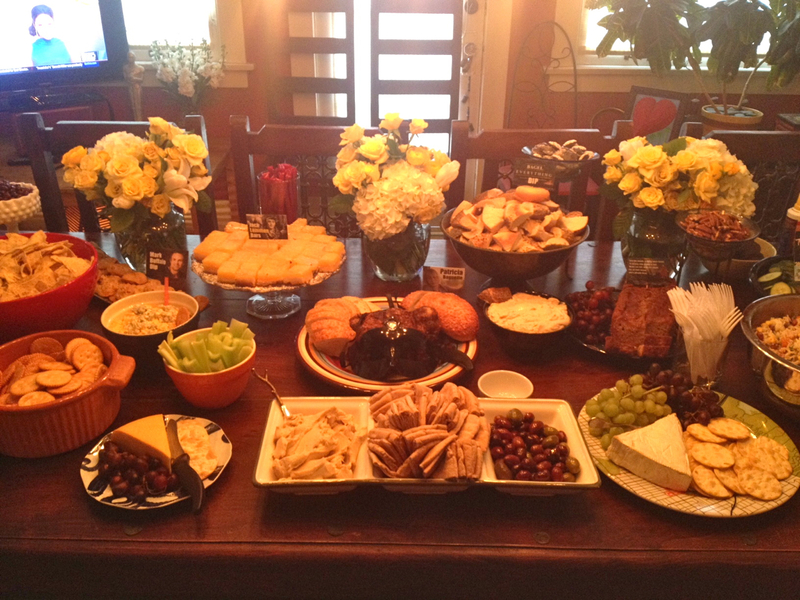 My food spread included Patricia Baguettes with Mark Buffalo dip, and Julianne Smoores for dessert. Albert wired the house for tvs and lit up the yard and house with colored lights. The wysteria and jasmine were in full bloom to scent the party like candy. It was a week of setting up and week of cleaning up afterwards, but always worth it to party with new and old friends. Also, my favorite movie of the year actually took the Best Picture award. Go Birdman! I am thrilled that our house has been featured in a new lifestyle magazine called Labor of Love. It is a specialty publication that looks at the lives and homes of creative people, and I am honored to be included with people that are much more talented than myself. You can download the premier issue for FREE for the month of March at the link below. Or, if you can, please purchase your copy today and help support this creative endeavour! Did I mention that I’m in it?